When Matthew Boulton, James Watt, and William Murdoch stood at the bottom of Broad Street and stuck some post-its on the wall to plan their first sprint, little did they know they would set in motion a revolution that would see the word “silicon” put in front of every inanimate object known to man. For when the three luminaries banded together at their first stand up meeting to build their minimum viable steam engine (the first two week sprint yielded nothing more than a kettle on stilts) they had unwittingly invented startup culture. It is said that Matthew Boulton first gained the money to build the Boulton and Watt steam engine, the invention which would bring about the industrial revolution, from an initial round of seed funding together with the money he raised from selling his original company, a chain of tea bars. The tea bars themselves were the very first copy of an already successful social network, the coffee house (the chain later failed owing to debts mounted up through a large unpaid tax bill). Every morning, before starting work, Boulton, Watt and Murdoch would gather together on a plinth at the top of Broad Street and, in turn, tell each other what they did yesterday, what they were going to do today, and what their blockers were. Their work would be packaged into short pieces of work, called “stories” (One example, sourced from company records was: “As a mine owner, I would like to condense my steam, so I can use less coal”). 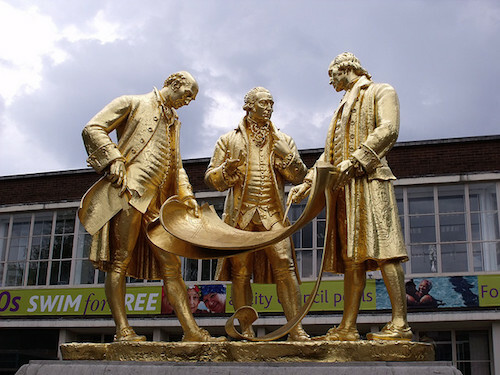 The success of the trio’s startup attracted the attention of other would-be West Midlands entrepreneurs, including Josiah Wedgwood, who did something with plates (records are unclear on this), and Erasmus Darwin, who despite coming from Lichfield, braved the staff shortages and delays of the cross-city line to Birmingham to meet with other like-minded individuals. But it was another member of Birmingham’s startup community that would threaten to tear the community apart – Joseph Priestley began writing a series of scurrilous pamphlets about the burgeoning scene, but after refusing to pay contributors, he was driven out of the city by pitchfork wielding journalists. While in exile, he wrote further pamphlets attacking the people who drove him out, as well as making a healthy living espousing controversial opinions at public events for money. Although the steam engine was a success, the “fail fast” culture yielded many failures, including a new monetary system based on calculations made by teams of children using abacuses, and a driverless horse and cart, which lost control on its maiden voyage down Bull Street, killing dozens. While there were failures and controversies, Birmingham’s startup scene grew and grew, until there were none. Over time, the city’s startups grew into bigger businesses, until they looked from small to big, and big to small, and it was impossible to say which was which. Spent his formative years in the hinterlands of Brum, and never left really. Has an NCTJ certificate in journalism, but has never held down a paying job in the industry. Has an encyclopaedic knowledge of both the West Coast Mainline and the Cross-City Line.